We don’t mean to burst tomatoes’ bubble, but when you literally burst tomatoes in the oven, they become all the more delicious. And while we hate to imagine them straining, seizing, and shriveling under that sizzling heat, they come out on the other side with a flavor that’s concentrated and juicy. 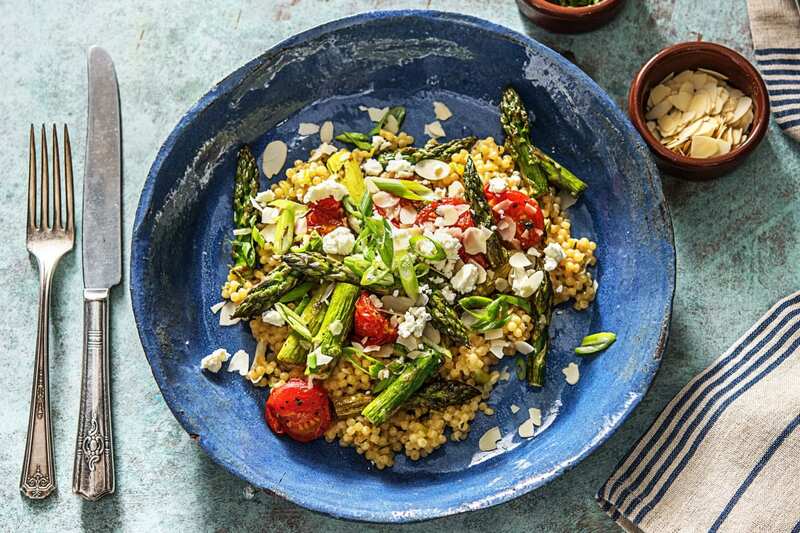 It allows them to hold their own against the assertive flavors in this dish, from briny feta cheese to grassy green asparagus. Adjust rack to middle position and preheat oven to 450 degrees. Wash and dry all produce. Mince or grate garlic. 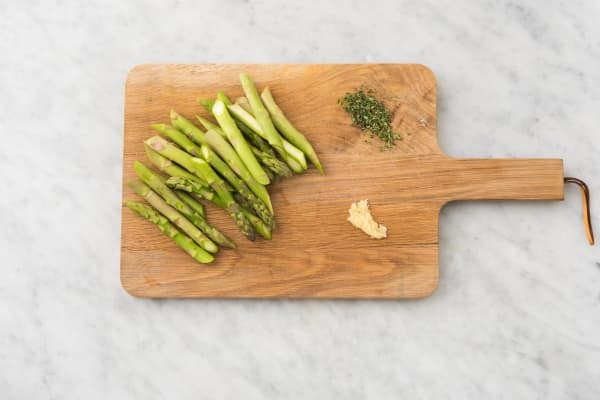 Trim and discard woody bottoms from asparagus, then cut into 3-inch pieces. Halve tomatoes. Strip thyme leaves from stems. Discard stems; roughly chop leaves. 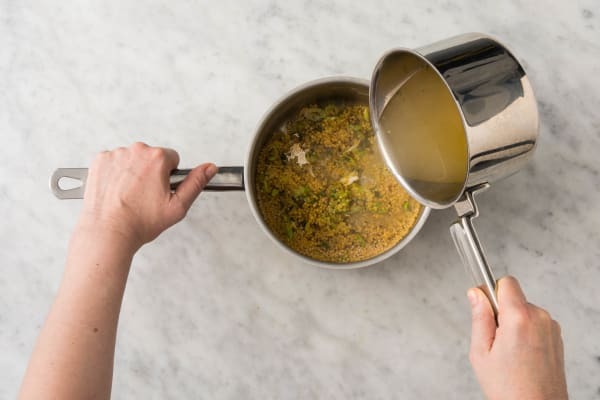 Put stock concentrates and 1 cup water in a small pot and bring to a simmer. 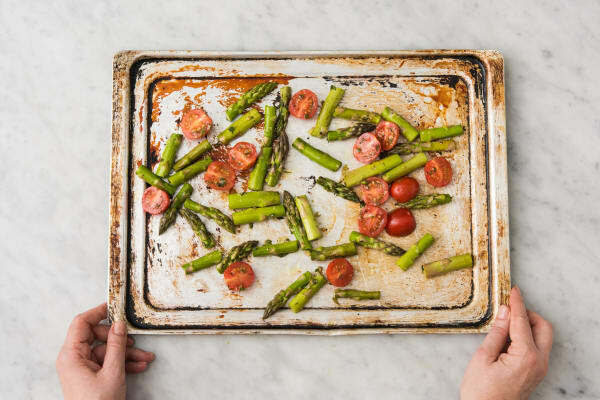 Toss garlic, asparagus, tomatoes, half the thyme, and a drizzle of olive oil on a baking sheet. Season with salt and pepper. Roast in oven until asparagus is tender and tomatoes burst, about 20 minutes, tossing halfway through. Trim and thinly slice scallions, separating whites from greens. 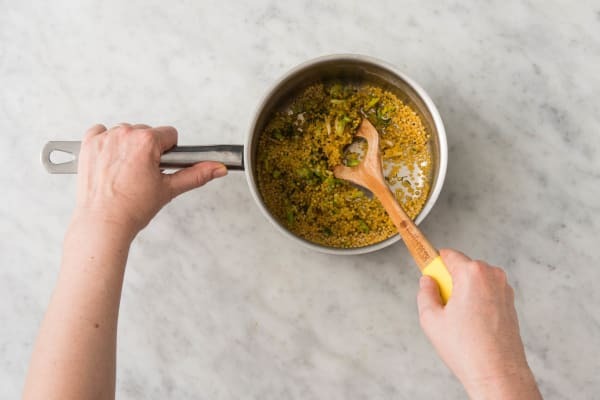 Melt 1 TBSP butter in a medium pot over medium heat. 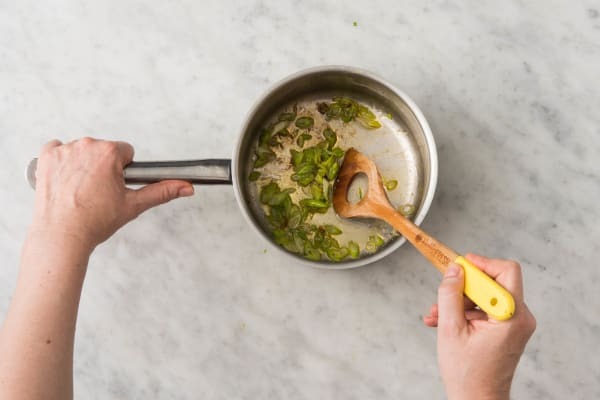 Add scallion whites and cook, tossing, until fragrant, 1-2 minutes. Add couscous and remaining thyme. Cook, tossing, until grains are lightly toasted, about 1 minute. Pour simmering stock into pot with couscous. Reduce heat to low, cover, and simmer until tender, 8-10 minutes. Fluff couscous with a fork. Season with salt and pepper. Divide between plates, then top with roasted veggies. 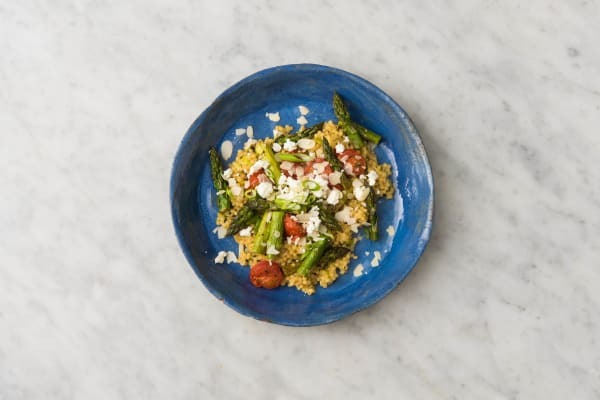 Sprinkle with almonds, feta cheese, and scallion greens.